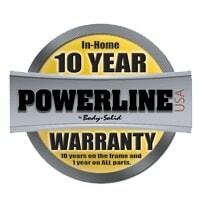 Body-Solid PLA200X Lat Attachment for PPR200X Power Rack – The Powerline PLA200X by Body-Solid is an optional attachment for the Powerline PPR200X Power Rack. The plate-load carriage on this lat attachment features 1" diameter weight posts that will accommodate Standard weight plates, or Olympic weight plates when fitted with optional Olympic adapter sleeves. Transform your Body-Solid PPR200X Power Rack into a multi-workout machine. This Lat Attachment will help you build a wider, beefier back and stronger and bigger biceps and triceps. Features nylon coated, aircraft quality (2200 lb. test) cables. Includes Lat Bar and Low Row Bar which can attach to high or low pulley for a variety of upper body exercises. Package 1: 46.85" L x 11.42" W x 7.87" H | 47 lbs. Package 2: 75.20" L x 1.97" W x 1.97" H | 10 lbs. Need additional weight training equipment for your home gym or fitness studio? Contact an IRON COMPANY® fitness equipment specialist today at 1-888-758-7527 or email quotes@ironcompany.com.